Art Before Breakfast: Negative Space. Every Friday I work through an idea from Art Before Breakfast. It would be lovely if I could imagine you out there drawing along with me. This particular exercise comes from pages 26-27. If you decide to do it too, please share with me how it turned out! (Share the results on your own blog or on Facebook and post a link in my comments section. Use #artb4bkfst on Twitter or FB). Such a novel and good approach to drawing. 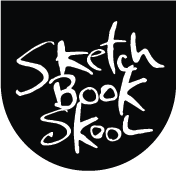 I am drawing with you each time and started a new sketch book and see it is important to get your book. This is really eye opening. Thanks! I’m sorry you’re having a problem, Karen, but I’m not quite sure what you mean. The audio levels are pretty standard. Danny, The audio level on this video is way too low. John, I checked the audio and it is fine on my system. I have only had one other person mention the audio level so I am perplexed. Fab video but also struggled to hear what you were saying. Its not just Karen, John, & joolzbenner. I had to use the external speakers for my laptop in order to adequately hear the audio (and my hearing’s very good). Now that I can hear them, I’m enjoying this series of videos. Thanks ! I am enjoying the videos. The length and simplicity inspire me to try. Excellent work. Oh, and I can hear them perfectly! Enjoy the lessons and book. I can hear you just fine from my iPad. Do we upload are images here somehow?